On the far West side of Koh Phangan about 30 meters from the main road lies a small white sandy beach called Shri Thanu Beach. The village nearby is called Baan Sri Thanu hence why the beach has been named Sri Thanu beach or in Thai Ao Sri Thanu. Its got a width of nearly 100 meters and the length of the beach is about 500 meters. Its totally covered in white sand with a few resorts and restaurants at the back of the beach including Phangan Cove. On the right side of the beach you will find an inlet which the fisherman use to moor there boats, this also a supply route or run off for the lake which is further North of Baan Shri Thanu.Also on the left side you will see alot of rocks sticking out of the water and at the end you will see a small lighthouse to guide boats. Also on the left side you will find the late night bar called Three Monkeys, which is an excellent little meeting place for a few drinks. The lake called Laem Som Lake has a small river of water that runs the entire length of the beach, at the back part of all the resorts. Bridges all the way along can easily be found to access the beach from the main road and Baan Sri Thanu. The right side of the beach breaks into rocks with a path way leading to the next beach, which makes an interesting walk. The water has a low tide and high tide which is common through out the Gulf of Thailand. During peak season December and January the water is quite high and makes very good swimming, low season, the water is lower and most the beach takes on a new look with under-bed of the sea showing for many months.See Phangan Tide for more on the tides around Phangan. The beach faces West so you always get a sunset and some really good ones do happen on this beach. There are a few restaurants on the beach including Phangan Cove Restaurant that all have comfortable seating for watching the sunset and drinking a cool drink. Great beach for sunbathing, with refreshments easily found from some of the local resorts and restaurants. The sea is great for swimming during the high season and peak season. The bottom is partly sand and pebbles. Most resorts on the beach have deck chairs outside there resort to use on the beach, although the beach is not covered in sunbeds like European beaches. Massage parlors setup in small wooden shacks can also be found on the beach. 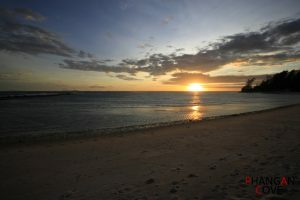 Overall this is a great beach, perfect sunset watching spot and its never over crowded. Safe for children and ideal getaway spot.